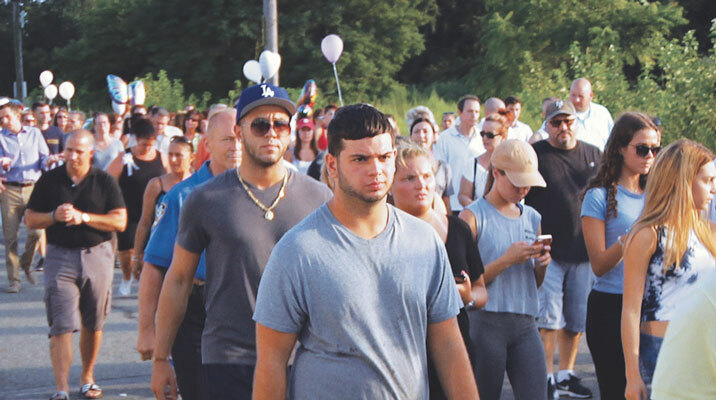 Now known as the “trail of tears,” nearly a thousand family members, friends and local residents gravely walked along Spring Creek Park, Howard Beach, for the Karina Vetrano memorial walk Aug. 16. Exactly two weeks prior to the event, the 30-year-old jogger’s battered body was discovered in the dense weeds near her Howard Beach home. “Don’t protect him! He is of no use to anyone,” said Cathy Vetrano, Karina’s mother, as she addressed the media about her daughter’s killer, before leading the pack of walkers from 165th Avenue down 83rd Street. “It’s been a hard two weeks, but we’re taking it day-by-day. It’s a tragedy, but we’re here to celebrate,” said Jackie Hartstein, a friend of Vetrano’s. At the time of the event, $125,000 was being awarded to anyone with information leading to a conviction. In addition, a GoFundMe page has raised over $250,000, which will be donated to charities and scholarships in Vetrano’s name. Crime posters with Vetrano’s picture are stapled to lightposts and traffic signs throughout the Howard Beach community. Local residents said until the killer is caught, they are on alert. But on this night, no one was alone. The hundreds of supporters walked in solidarity and gathered in the parking lot across the street from St. Helen’s Church – where the young woman’s funeral was held. At the corner of 157th Avenue and 84th Street, the congregation held a moment of silence before releasing the balloons into the evening sky in honor of the late Karina Vetrano.